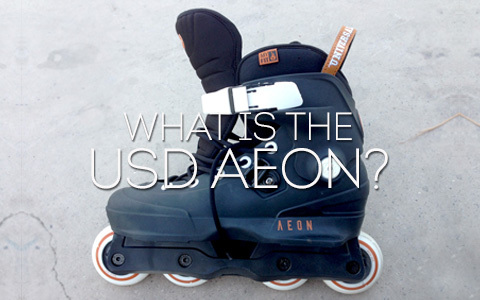 ONEblademag - What is the USD AEON? What is the USD AEON? USD made waves last month when news of their latest hard boot, the AEON, escaped from the halls of the ISPO tradeshow. A forward-facing, minimalist design that fused frame/boot/soul plate into one-piece, the skate was an instant flashpoint of discussion for the implications of a product that so brazenly eschewed traditional UFS ideology. “Would it be less expensive?” “What kind of performance improvements can be expected?” “What does it mean for the other skates USD produces?” We wondered too, and USD’s Kenneth Dedeu took time to answer our questions and provide some very interesting information about the newest hard boot mold to hit the industry. Read on! So, getting started, it seems like since unveiling the Carbon skate several years ago, simplification of the boot became a priority for USD. Like, the Carbon concept was a mile away — at least the final product — from the Legacy, what with all its external supports and stuff. Is it fair to assume that the Carbon and its offshoots like the Carbon Free have been successful for USD? Well, I can’t talk about the Legacy really because I started to work at USD just after that, but developing the Carbon skate (at that time under the Deshi label), our goal was to reduce the boot into its most basic elements — no liner, no pump system, no adjustable grooves, no cuff… even the upper design was super simple and clean. Then the soul plate was made of one single piece, sleek and lightweight, nothing to do with the first generation of Deshi soul plates! So yes, after the merging with USD and a few other improvements, the USD Carbon became our most popular skate followed by the more affordable version, the USD Carbon Free. Pretty much all the USD riders skate the Carbons, and a few other brands have followed our path, so yeah, I can say that project was a total success and helped move USD from the dark ages of the Legacy era into its current popularity. Like I just mentioned and you elaborated on, the Carbon — slim profile boot, low-profile soul plate — has about as small of a footprint as any skate on the market. How did the initiative for an even simpler product come about? We saw it as a necessity really, not only for USD but for the industry. The thing is, the Carbon is amazing — everyone loves it — but we knew it was time to start working on something different, and a new skin for an old shell wasn’t enough. We wanted a new hard boot. One of the reasons is the need to simplify production and reduce manufacturing costs, so less hand labor on every skate, less materials, etc. The second reason — and a very important one — is we wanted to create a true new skate, a skate that looks like a skate and not like a shoe. Since the release of the RB TRS in the early ‘00s I feel we all worked to make inline skates look like shoes, and it has been 15 years getting closer to looking like sneakers and further from skates. I am a huge fan of sneakers and shoes, but we reached some pretty nonsensical levels. It was time to bring a new fresh hard boot into aggressive, not only one that meets the standards of today’s technology but to be years ahead of everything that is available in the market. The main concept came out of brainstorming for a possible aggressive skate with big wheels. We came up with many ideas around trying to improve the experience of grinding with big wheels — shortening the gap between aggressive, powerblading and free skating — allowing people to use the same skates for street, park, cruising or transportation. We believe this is the way to catch new kids into the sport, basically the same as it was back in the day, when skaters didn’t change frames and wheels every time they roll from one spot to the other. Back when you could actually see bladers skating fast down the streets and not just carrying their skates in bags or even on bikes! 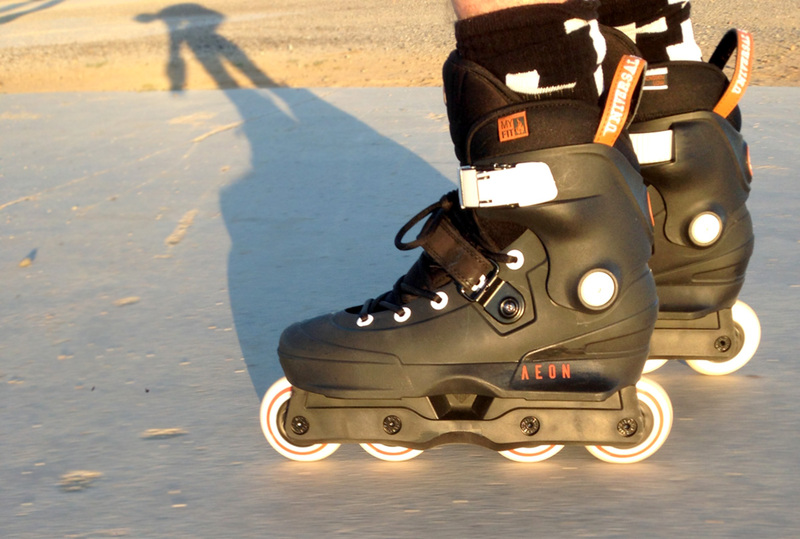 Powerblading is becoming quiet popular but big wheels mean higher frames and smaller h-blocks and the reason for that is the UFS mounting, so we decided to get rid of it, get rid of the whole frames thing, reduce the skate to the most essential elements. You don’t have extra parts, no hardware, no stripped screws anymore(! ), a dream come true for many of us. 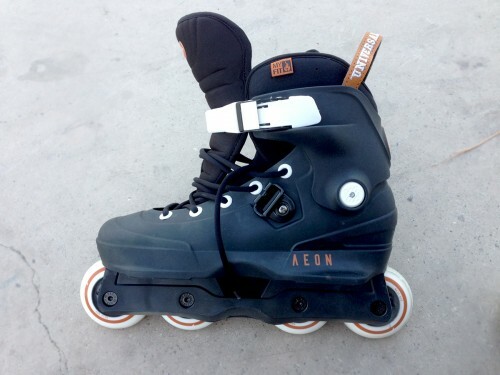 The AEON was reduced to the minimum, is the simplest skate ever produced, just one shell with a liner, a cuff and wheels. But in the other hand the design process and the production of the molds was by far the most complicated project we have ever dealt with. We understand there are two versions, a 60(? )mm frame and a 72mm frame. Is that correct? Are there any other difference between the models? There is the 72mm model and the 61mm which comes with stock 61mm wheels. They are exactly the same and the only difference is the frame area. Just for the record, there is no clear AEON, that was a sample to explain the concept at the ISPO and it won’t be produced. It actually can’t be, unfortunately. 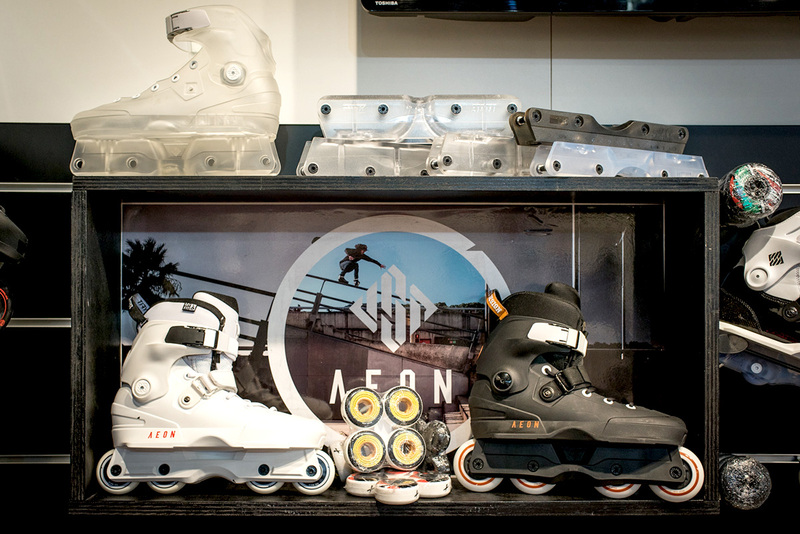 Okay Kenneth, you’ve touched on some of the overall benefits of the concept, but to the regular blading person who just wants to enjoy their skates and have them work properly, what are the main benefits to the one-piece manufacturing process of the AEON? Lower cost at retail? Higher performance? Lower weight? A hard boot is way easier to produce for sure, there is no need to search for fabrics, buy materials, no stitching work, lasting the upper by hand… it’s just an injected mold with a liner and wheels — so yeah, lower retail price for sure! Less hardware means less weight and that means cheaper shipments, better for warehouse storage, also less parts means less stock for shops and less things that can be broken or come up with flaws, so less returns for shops and overall a more durable skate. Like I said, the AEON is something the industry needed — until now the shops had to stock all the frames, soul plates and shells in all sizes and colors, with their own hardware, packaging, etc. Now it will be one single piece in each size and with no hardware! So shipping is cheaper, storing is easier and the price is lower. 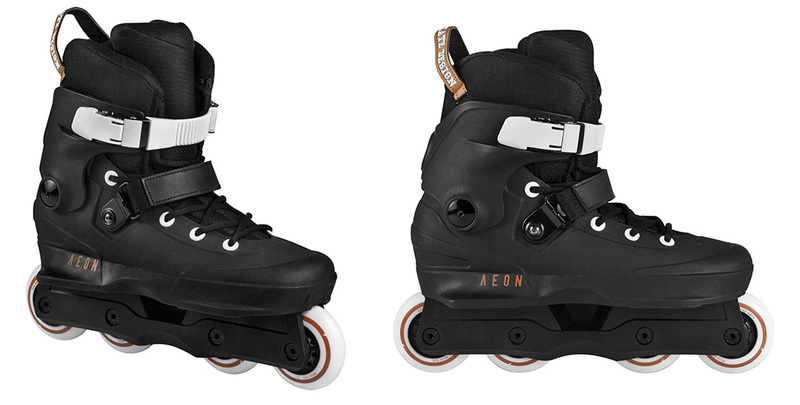 But I know most bladers don’t give a damn about all this stuff, what they want to know is this: The AEON is super low, in the 72mm AEON the foot is actually closer to the ground than in any skates on the market mounting 58mm wheels! And you can really feel that, especially on transitions. Actually, the first time I tried the skates I spent hours just carving in a bowl — it was such an amazing feeling, I had never skated it that fast. So what we did is place the wheels right under the sole of your foot and shape the soul plate around it, making the AEON the most responsive, the lowest, and the lightest USD skate yet. A really cool side effect of the unibody construction is the AEONs are extremely silent, there’s no more toy skates noise, these are ninja boots! Since The Conference is a company that makes some of the best accessory brands on the market, specifically the frame company Kizer, how does a product like the Aeon fit into that strategy? Is it still a Kizer frame if it comes molded into the USD boot? I am sure many people involved in frames and skate companies will blame the AEONs, but the truth is in the current shrinking market most aftermarket and accessory companies will have a hard time no matter what, the AEON is simply a new option, and at many levels a better product too. What about the actual manufacturing process? We know that the materials in a soul plate are different (at least historically) from the materials in a frame and those are both different plastics than you find in a boot shell. How have you guys been able to bring all those materials together and bond them at the manufacturing level? Is it just a really complex version of a “dual pour” wheel? That was extremely tricky, finding a material that is hard enough to keep everything together and resist the abuse of aggressive skating, slide well and a the same time be soft and bend in the right areas. Some people said it was impossible but at the end it worked out. It is basically all one material, it is not separated as in the dual density wheels. What we did was to use different hardnesses and different thicknesses for each area — as I said it was not easy at all, but the same unibody construction is what makes it really strong. Can you tell us about the sizing? What size shells will exist? How close does the foot sit to the top of the soul plate/frame/wheels? The sizing is the same as most of the hard boots: US sizing: 6-7, 7.5-8, 9-10, 11-12 and EU sizing: 39-40, 41-42, 43-44, 45-47. What is interesting is we are using super-slim liners so the skate looks really small and also we developed a new lasting (shape of the inside of the skate) so it will be very comfortable even for bladers with wide feet. Do you imagine this sort of one-piece skate becoming more common? Since 1999 and the unveiling of the Universal Frame System, the unspoken goal of many manufacturers has been compatibility. The AEON charts a different approach. Of course you guys are just at the starting line for this new venture, but what’s the mid-term outlook? Like I said, USD will continue to produce all the other UFS models, only the Aeon is different and I guess only time will tell what is the right way to go. To be honest I would like to see more stuff in the one-piece direction, but is not likely many brands will follow our path this time. Word on the street is that these will replace the Throne. That true? How long did the Thrones rule supreme? Sadly the Throne can’t be produced any longer. The molds are almost 20 years old, using technology nobody uses anymore, so the factory can’t keep working with them. We are having production issues with boots breaking and with irregular thickness of the shells, so yes, sooner or later they will be gone for good. It is our favorite skate, and the flagship of USD, but it is time to move on. The AEON was not planned as the replacement of the Classic Throne, but we hope it can fill that void and be a worthy successor. The good thing is we have already had a few dedicated-to-death Throne fans loving the AEON, saying they can’t go back to skate anything else. So that’s a good sign. What’s the expected in-store date? If they are not delayed, both models should be available worldwide in May 2015. Well thanks, Kenneth. They sound really interesting and we look forward to trying them out! The idea of being so low to the boot, and grinding with a different feeling because of sitting INSIDE the soul plate is so intriguing. I think a lot of people will want to at least see how they roll. Thanks to you guys, I really hope everyone can try them soon and enjoy them as much as we do! I know many people are skeptical about the AEON; Why buy a skate with no replaceable parts? But we see it the other way, instead thinking that every time you replace the frame you get a complete new skate! And because the AEON is extremely durable — it is really made to last — but whenever you need to replace the shell, for the price of a frame you will get a frame, a soul plate and a shinny new shell. We see it as the end of the circle, going back to the roots of aggressive skating but at the same time taking everything we have learned and starting a new era, that’s basically what the symbol and the name means — for us the AEON is the rebirth of the hard boot. Really interesting. 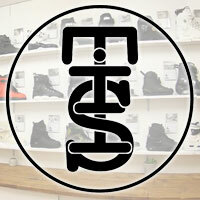 Be a good starter skate for all styles until you settle into what you wana do. Hard boots are fine as long as the liners are decent. Also cheaper skates from a known brand should attract people to the sport. Great article/interview, thanks! I’m really excited to try these, I’m thinking they will have a very solid feel from the wheels right up to the top of the cuff, and sitting so low on 72mm wheels sounds great. Hopefully I can get some before summer! Thanks for the great overview of the skate. They sounds amazing. Can’t wait to try them. The Franky Morales Jordan-style Carbons are hands down some of the coolest looking skates there have ever been. What is this guy on about? When your skates wear down after few cess slides and the grooves don’t lock on to rails anymore, you can look forward to a brand new pair of skates! They wont be another pair of Aeons, that’s for sure. What are the shell sizes? Is there only 1 color option for each model? Does the 60mm version sit lower than the 72mm? Is there a shock absorber in the footbed or in the shell? Any idea how much they’ll be? its a good looking skate but the fact that it isnt ufs or have removable parts really gets to me…sure, thats great for USD but what happens when you grind a groove so big into your frame you have nothing left? or if you grind a hole into your soulplate? then you have to buy a whole new skate? and the fact that they are trying to go back to the ways of the old school kinda bothers me too…cause its taken years to get skates to where they are now..replaceable soul plates and the UFS system revolutionized the game and now all of a sudden they are abandoning the option of choice? for a skate with no options like this i hope its really cheap….like $100 cheap…. That boot looks like the old mold for the old Salomon hardboot. Look it up! Its a Salomon with the usd U cut cuff.